Portvgalliae que olim Lusitania, novissima & exactissima descriptio, Aucto re Vernando Aluaro Secco (A very new & exact depiction of Portugal, once called Lusitania, by Vernandus Alvarus Secco). 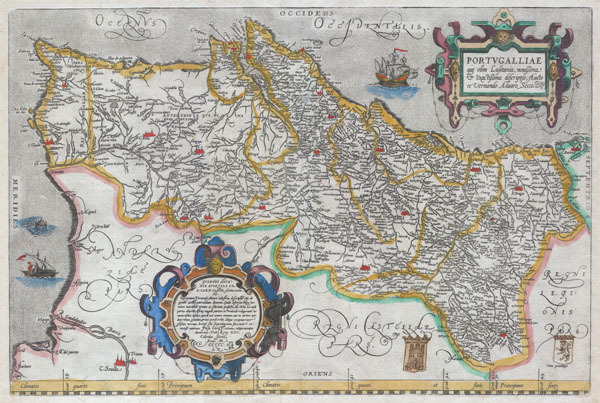 A rare and beautiful 1579 Abraham Ortelius map of the Kingdom of Portugal. Follows the extremely rare two sheet Alavaraz Secco map published by Michele Tramezzino in 1561. North oriented to the right. Sea decorated with monsters and sailing ships. Bottom right features two hand drawn heraldic emblems, a rather unique variation on this map. Features two elaborate cartouches in the top right and bottom left. Top right cartouche contains the map title in Latin, translated above. Bottom left cartouche include the following roughly translated text: Achilles Statius salutes Guido Ascanius Sfortia, S.R.E. Card. Camer. With dedication the Lusitania of Vernandus Alvarus has been depicted for you, Guido Sfortia, because we call it the protectorate of our people: from here men have sailed out with incredible courage in foul and fair. They have frequented all parts of the world. They added a large part of Africa to our country; countless is the number of islands, known only by name or not even that, because they had no name, which they first discovered and took in their possession. The most fair lands of Asia they have made tributaries; the most distant lands they taught the service and religion of Jesus Christ. Fare thee well. Rome, on the 13th day of the Calends of June, in the year 1560. Approximately 250 impressions of this exact state were printed. Approximately 8175 copies of this map, in various states, were printed from roughly 1570 to 1641. Most have been lost or destroyed. A very rare map. Very good condition. Minor expert repair on certerfold approximately 4 inches below the border. Wide clean margins. Original platemark. Latin text on verso. Marcel van den Broecke No. 26. ; Meurer p. 234 ; Karrow 67/1 p. 472-474.